One of the first questions I hear from new climbers is: “can I buy used gear?” (or “where can I buy used climbing gear?”). I had this same question when I started out. With nobody to ask, I bought a used harness off Craigslist. Unfortunately, I didn’t know much about harnesses so I just looked for wear, and it didn’t have much, so I bought the harness. Turns out the harness was an older one–not a totally bad thing, except that meant there were no instructions how to use it and it was an (older) uncomfortable style. I used it 3 times, once incorrectly, before I spent real money and got a new one. Back to the point: Can I buy used climbing gear? The answer: Maybe. Yes, for some of the equipment, No for some of it and there’s also a big gray area of when it’s ok. Let’s expand on that. Rope – There’s no guarantee that a rope hasn’t been stored improperly or taken a lot of falls even though it looks brand new. You don’t know the original color–the whole rope could be UV damaged but you can’t prove it. A rope that sat in a closet and not used for many years can also be a cause for concern because of it’s lack of use. Harness – You can’t try a harness on and hang in it when you buy it used, so there’s no guarantee it will fit well. An ill-fitting harness is problematic for comfort and safety. Used harnesses rarely come with instructions too. More safety features have been added in the last few years, like wear markers and smarter buckles, that make it worth spending the money to buy new. Helmet – There’s no guarantee that a helmet hasn’t taken a crazy fall just because it doesn’t have any cracks, deep scratches, or dents. There’s no way to totally ensure the integrity of a used helmet. Webbing/Slings – Heavy use will not necessarily show in the weave. There may be no visual signs of abuse/problems yet the holding power may be compromised. Technically you could buy these items used and not die. But at the same time, you’re taking a huge risk because all of this gear directly holds your life in it’s hands. All this gear can also give misleading signs of “looking good” while it could still be damaged. The only exception to buying this type of gear used would be if your best friend, that you trust with your life, got into climbing, but didn’t like it, and wants to sell his gear to you. Or your super trustworthy climbing mentor upgraded their gear, and they’re getting rid of their starter setup. This list is all soft goods, or gear that doesn’t directly hold your life on the line. Just because you’re buying gear that we’ve stated is fine to buy used, does not mean that you can skip inspection before purchase. The biggest problem with buying online is you can’t hold it and do an incredibly thorough inspection, or try it on to see if it actually fits. Always avoid sellers who do not know about the gear and/or it’s history. Or a person who won’t send you photos. Selling “for a friend” is definitely a red flag. I bought a sleeping bag off Craigslist after reading about what a great deal it was compared to MSRP. The reviews for the sleeping bag seemed perfect, “super warm” and “classic” were common terms, and it was made by a top name brand, exactly what I needed for my mountaineering efforts! I asked the guy why he was selling, and he said the bag was great, but he doesn’t camp much. He seemed genuine in his report but in retrospect I don’t think he ever went backpacking with it (I never asked HOW he used it). That synthetic long bag (I’m 5’2”, not 6’6”) took up half my pack! Now I use the bag as a super comfy car camping bag, but I never put it in my backpack. Bottom line: used only once for intended purpose = Money Wasted. Carabiners – make sure the gate pin(s) are in good shape, the gates open and close without sticking, the lock (if any) works well and the body isn’t bent or out of alignment in any way. You should note any significant wearing like deep scratches or grooves. Belay Device – $20 will buy a new one that lasts over 10 years so why buy the “old” version used? Instead, buy the model with teeth (a somewhat new technology) and cut-outs that make it lightweight. If you insist on saving $5 buying used, check for wear, does the belay device still have it’s original color? Know that pyramid-shaped devices haven’t been made in years. Active/Passive Protection (cams, nuts, hexes) – best to handle in-person (at a minimum ask for lots of photos of it’s online), and check for frayed wires, deformity, integrity, sling condition, and visual wear. If you don’t know the anatomy of the gear you’re buying, don’t buy used. The best resources to buy this type of gear used, other than your climbing partners/mentors, would be trusted climbing forums–your local forums or MountainProject or SuperTopo. Buying from a user who has a lot of “credibility” or “karma” built up through posting and is a known local is much better than somebody who just signed up for the site, a Craiglist ad, or Ebay posting. One of my girlfriends found (and subsequently purchased) a full set of Metolius Master Cams from Cascade Climbers (a local Pacific NW climbing forum). She’s been climbing for many years and knew exactly what gear she wanted. When considering the purchase, she made sure the seller sent her up close photos of each piece of gear, along with specific information about use. Given the price and the described wear, she decided to buy them. When she received the cams she inspected each one–they were all as described, and in great shape. She did some quick maintenance before using and that was it. Overall she found the experience to be rewarding (especially financially). Note the lack of details, no pictures, and misspellings. What type of “rope” are they selling? It’s probably a rope for glacier travel, not rock climbing, but who knows (this seller may not even know). The more details the better, and the more photos, the higher the chance that you’ll come out unscathed from the deal. If buying used gear seems sketchy, but you’re still looking for a cheaper price there are some alternative stores that sell closeouts & cosmetic blemishes (aka “blems”). Or you can wait for climbing gear sales. WeighMyRack lists all the gear that’s currently on sale on this blog, check out the sidebar on the right. Our recommendation: Buy used gear when you’re an intermediate/advanced climber, not a beginner. When you’re beginning the costs may seem high, but they’re actually lower than if you continue the sport (you’ll get much pickier along the way). If you’re not completely comfortable with gear anatomy or if you don’t know exactly what you’re looking for, don’t buy used. If/when you expand to leading and outdoor climbing, and after you’ve done a lot of gear research, it’s a much better time to explore buying used because you’ll know how to look (and test) for safe gear. Think of buying used gear as a calculated risk. There’s a reason that stores do not sell used climbing gear. Even though REI allows you to return climbing gear, they destroy it. It’s not re-sold. The above recommendations are a great starting point, not set in stone rules. We all know climbing can be dangerous. Climbing gear is here to protect your life (otherwise we’d all be free-soloing). Every time you buy a used peice of gear you’re adding on another layer of risk and decreasing your level of protection. It’s up to you to decide if the risk is worth the monetary savings. If I missed any safe “cheap” gear resources, let me know and I’ll add them in. Or feel free to tell tales of your gear buying experiences in the comments! Nice post Alison–really thorough and educational! Well done. Great advice Alison! I’m on the same page with nearly each point you made. Personally I had a bad experience borrowing a friend’s ill-fitting pair of shoes, but that was for hiking not climbing. Two different beasts. Both worthwhile of course! Alison; good stuff! Rainier in August with RMI. I think at this point I am concentrating on clothing as that seems to be the place to put limited funds; besides I like to stay warm and dry; hardwear I will rent from them. That seems to fit into your philosophy, sort of, eh? I did COBS in ’89, the thirty day course, older now…… (63), so this trip will be to see how I do. If a couple of Rainier trips go well, Denali next, the dream….? Himalayas! I live on Cape Cod, the coast of Ma., so if you are rolling this way let me know. It’s all about the big dreams Don! Rainier is a blast and staying warm is definitely key. When I climbed Rainier I think my experience was so much better because I had great fitting boots and had layers that allowed me to be comfortable in all sorts of temperatures. Renting hardware is definitely the best bet if you won’t be using the goods much (since there’s not so many volcanos on the East…). And it also let’s you try out the hardware to see if it really works for you. My home home is in Vermont, so we are definitely are on the east coast from time to time. Wishing you luck for your April ascent! It was necessary for someone to write on this topic and you grabbed the heart of millions by taking the initiative which is enough to bring the evolution. Thanks for bringing it to the light. Haha, we’re waiting in eager anticipation for the day that this post reaches millions. Cheers! Your blog is very useful and provides tremendous facts. It is going to change the way one thinks by a sharp angle. I wonder if you write on gadgets also. Keep up the good work ahead. We don’t write about electronic gadgets, but let us know if there are any climbing “gadgets” that you are referring to! I have a question regarding buying used climbing shoes. i’ve found some that have only been used a couple of times but about 4-5 years ago. 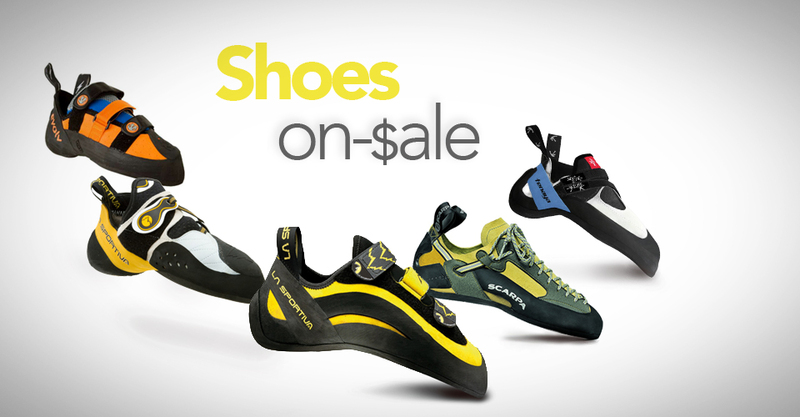 Do climbing shoes have a shelf life like a car seat? with a car seat or a helmet we are not supposed to use them after x number of years because materials break down. Does this same concept apply to climbing shoes(the rubber on the bottom)? Hi Natalie – those shoes should be perfectly fine. I have never heard/seen any numbers for rubber breakdown. And many climbers tout their old favorite pair of shoes that they’ve had for 10 or even 20 years, still going strong. Foam in helmets can break down, and the nylon that makes ropes degrades over time, but but metal hardgoods and shoes don’t have suggested limits. If I go out on a limb, it’s possible that with really intense/extreme heating and freezing periods the glue holding the rubber onto the body of the shoe could break down, but that would be obvious as the rubber would not be well attached to the shoe. And it’d also be quite unlikely. But really, when buying used shoes, the biggest issue i’d look for is if the rubber on the toe had started to wear away with any significance. Often times newer climbers drag their feet up the wall and this is the first spot to go. And depending on the abrasiveness of the wall, it could only take a few sessions before the shoes have a surprisingly large wear pattern on the front toe area. Also, before buying used shoes, I’d go to a retail shop and try on a bunch of pairs so you know the range of fit that is ideal for you. It’s really hard to judge a true fit when you only try on one size. One time, as a new mountaineer, I bought a sample pair mountaineering boots; they only had one size, and I thought it fit (and was allured by the deal), but it turned out, had I been able to try on other sizes I would have quickly realized they were too small.